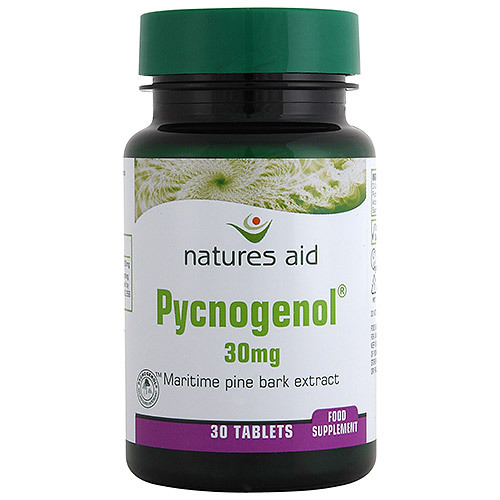 Natures Aid Pycnogenol contains 30mg of Pycnogenol. 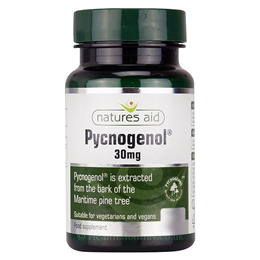 Pycnogenol is a powerful antioxidant, extracted from the bark of the Maritime Pine Tree. Di-Calcium Phosphate, Microcrystalline Cellulose, Pycnogenol® (Maritime Pine Bark Extract), Anticaking Agents (Silicon Dioxide, Vegetable Source Magnesium Stearate). As a food supplement for adults only, take 1 - 3 tablets per day with food. Below are reviews of Natures Aid Pycnogenol - 30 x 30mg Tablets by bodykind customers. If you have tried this product we'd love to hear what you think so please leave a review.